There is a need for a solid structured approach for describing and analysing solutions and approaches to digitalisation of manufacturing, including the deployment of digital manufacturing platforms. For example, engineering skills and tools are required and also employees need to have adapted skills for operating and managing the digital systems and tools. Another important aspect is the value or benefit obtained while progressing towards the right hand side of the pathway. For instance the factory would gain responsiveness and speed, improved quality and reduced down-time, resource-efficiency, etc… (And these gains do not only apply to the milestones on the right side, but also to the milestones that are situated on the left-hand side). These benefits will need to be compared to the financial resources or investment needed. From a more technical point of view, interoperability is extremely relevant, not only since systems and tools will very likely come from different vendors, but also since many legacy systems have to be integrated. Security is a requirement that may become increasingly important while progressing on the pathway. Cross-cutting aspects are described through a comprehensive set of structured lists, which also can be seen as a selfstanding 'structured glossary'. 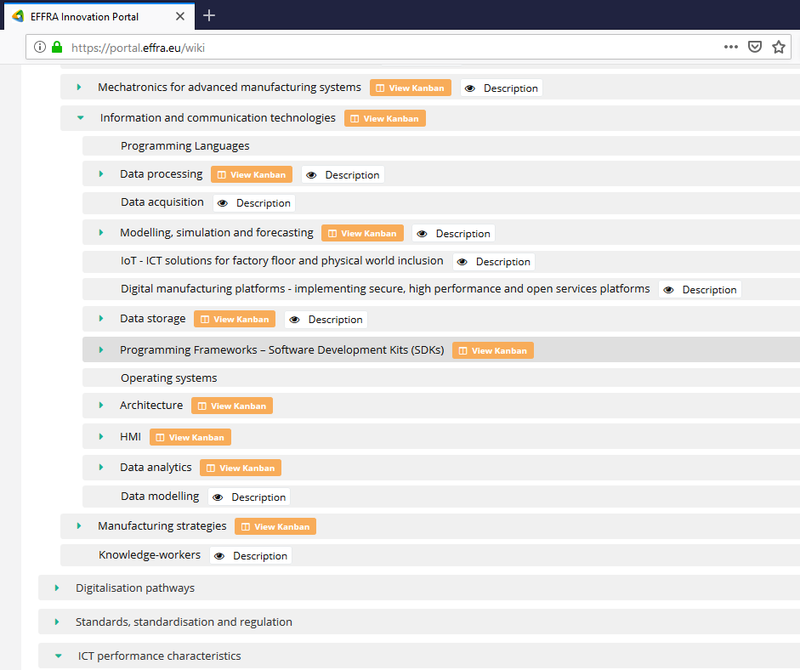 These lists are included in the structured Wiki (see picture below) of the EFFRA Innovation portal, such that the collection and sharing of information about R&D projects, demonstrators and use cases is more structured and accessable. 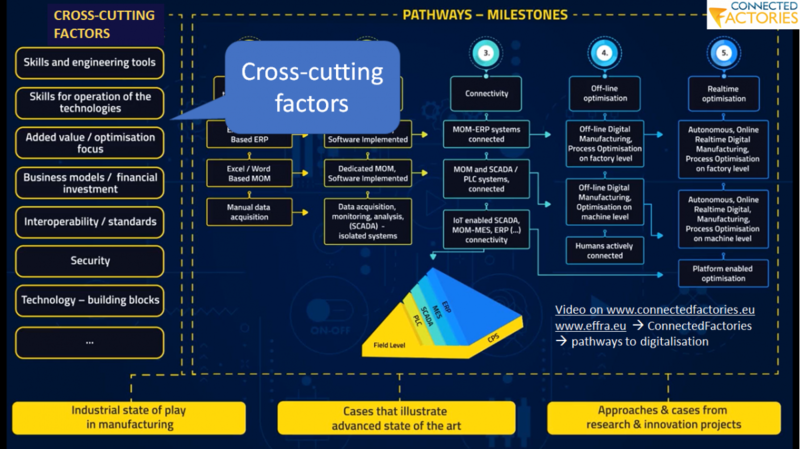 Existing structures or frameworks contributed to this structure, for example the RAMI 4.0 Reference Architecture Model Industrie 4.0 or work done by other FoF related projects, European and regional initiatives. Download a snapshot document reflecting the cross-cutting factors. The cross-cutting factors are an essential component for the sharing of information about project, demonstrators, solutions, etc.